A hate incident or hate crime is any incident/crime perceived, by the victim or any other person, to be motivated by prejudice or hate. This includes discrimination against a person's race, religion, sexuality, gender identity or disability. It can include criminal offences against a person or property. Examples of hate incidents include verbal or written abuse, harassment and intimidation, damage to property or physical assault. It can also include texts or emails. It is really important that you report hate incidents or crime so that we can work with you, and our partners, to try to address the problem. Please report hate crime/incidents if you are the victim, you have witnessed an incident or if you know someone who was the victim of an incident. You can contact Sussex Police to report hate crime/incidents or to find out further information here. If you would prefer to not contact the Police you can make a third party report which would result in the incident being recorded but not investigated any further. If you live in the Eastbourne or Rother areas you can report to your local Citiizens Advice Bureau. You can also report hate crime or hate incidents on the True Vision website. The website also provides information and advice regarding hate crime and incidents. 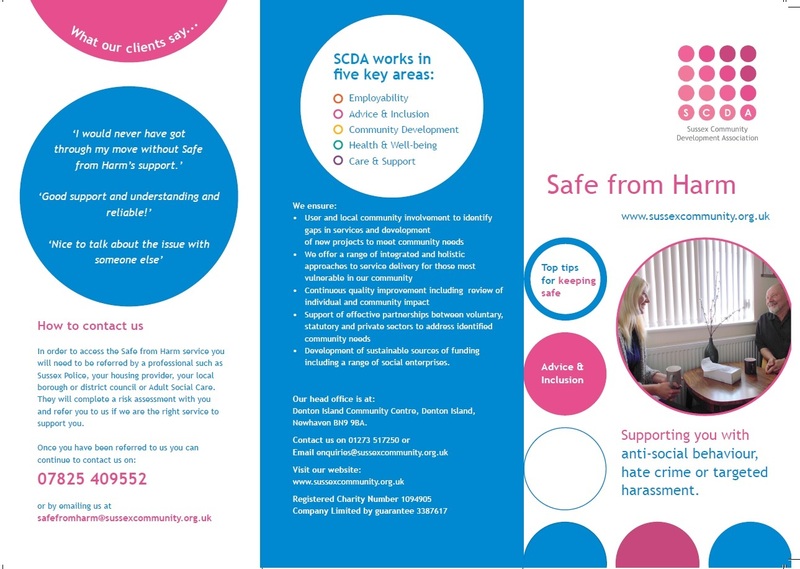 Sussex Community Development Association provide the Safe from Harm Service for high risk victims of hate or anti-social behaviour. In order to access the Safe from Harm service you will need to be referred by a professional such as Sussex Police, your housing provider, your local borough or district council or Adult Social Care. If you are experiencing anti-social behaviour there are some things you can do to help resolve the situation. • Sometimes speaking to the person responsible for the nuisance to explain the impact of their behaviour can be more effective than getting someone ‘official’ involved. Only do this if you feel confident and safe to do so. • Keep a record of the incidents, including times, dates and details of the activity. This can be sent to any organisation you report the problem to and is one of the best ways of gathering evidence. • Report it. Below is a guide to reporting specific types of anti-social behaviour and hate incidents. Depending on the problem you might want to report the incident to Sussex Police, your housing provider or your District or Borough Council. 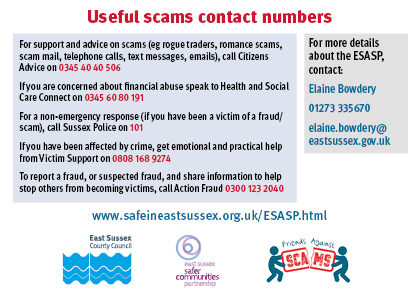 If you have been a victim or witness of a crime you should contact Sussex Police. If it is less urgent call 101. *Who you report these problems to depends on which district or borough of East Sussex that the incidents occur in. • Eastbourne – Eastbourne Borough Council website. • Hastings - Safer Hastings Partnership website. • Lewes – Lewes District Council website. • Rother – Rother District Council website. • Wealden – Wealden District Council website.